Packed with dining options, boasting a revitalized Downtown and great for a weekend getaway, Chattanooga, TN, is just slightly more than 100 miles to the north. (ATL traffic what it is, that means it&apos;s as close as an hour and a half by car, or as far as almost three hours if leaving right after work.) But there&apos;s more to the city&apos;s culinary landscape than just the birthplace of MoonPies. More than most towns around, Chattanooga is embracing its local food resources. Surrounded by Tennessee and Georgia farms, the city&apos;s restaurants heavily promote on signs, walls and menus the purveyors they source from — even to a degree that beats out Atlanta, where many chefs are passionate about the same but where that education doesn&apos;t trickle down to the diner. Here&apos;s where to eat on your next visit. Recently opened in the North Shore neighborhood across the river from Downtown, this good-spirited gastropub specializes in smoked food, meat and, uh, more meat. Check out the house-smoked pastrami and the duck burger. B&B also turns out a great weekend brunch. Insider Tip: Stop in for happy hour between 3-6 PM, when select food, beer and cocktails are at seriously reduced prices, and there&apos;s free popcorn aplenty for bar patrons. 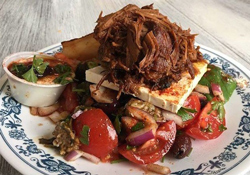 This modest-in-size new Greek eatery, located in a cute converted North Shore cottage, sends out some of the city&apos;s best Mediterranean food. Lamb gyros and the veggie plate loaded with hummus are both reliable, while the flaky baklava&apos;s a perfect sweet to wrap the meal. Insider Tip: Grab your food to go if it&apos;s a nice day — the restaurant&apos;s on the edge of the riverfront park. Is there anything fancy about this East Chattanooga restaurant? There is not. Is there anything delicious about it? Oh, so much. Specializing in pork cooked in the Michoacan style — all crisp and roasty and salty after being cooked in lard — this roadside Mexican spot serves up the city&apos;s tastiest tacos and tortas. Insider Tip: Be daring! Order the goat, the tongue, the tripe. This is the first non-Florida location for Maple Street, a collection of Jacksonville restaurants. Located in the heart of Chattanooga&apos;s tourist district, it makes for a great place to pop in for a filling, flavorful Southern snack and escape the people wandering around with maps. (Admittedly, maybe you&apos;re one of them.) 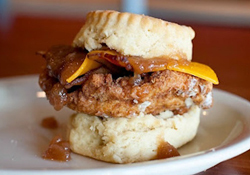 Order up a Reinhold biscuit (fried chicken breast, dill pickles, housemade honey mustard sauce) or go the sweet/savory route with the Farmer (fried chicken, pecan-smoked bacon, cheddar cheese and housemade apple butter). Insider Tip: Like the biscuits, but leaving soon? The staff swears the biscuits freeze well, so buy a boxful on your way out. This basement bar with a dive-bar vibe offers one of the city&apos;s best selections of craft beers, both on tap and in bottles and cans. The food menu&apos;s nothing to overlook, consisting of terrific sandwiches (the Seoulful mashes up Korean and Southern barbecue traditions to great effect) and sides. Insider Tip: Chattanooga still isn&apos;t a late-night kind of town; the Bitter Alibi stays open until 2 AM on Fridays and Saturdays, and shuts down at midnight the rest of the week. 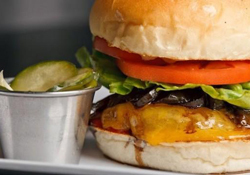 You might not expect a burger joint to care so deeply about sustainability, but this Southside restaurant&apos;s LEED certified and sources its meat and vegetables locally. Start off with fried bologna sliders (made in-house from a custom recipe) before picking from an overwhelming array of burgers — or just building your own. 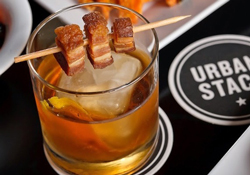 Insider Tip: You&apos;ll see the famous Benton&apos;s bacon, a smoky Tennesse treat, just about everywhere — even in your cocktails. Public House chef-owner Nathan Lindley (brother of the James Beard Award semifinalist Daniel Lindley) recently opened this temple to timeless Italian-American cooking, with the cuisine of NYC as an inspiration. Stick to the classics like lasagna, meatballs, chicken picatta and pork scallopini — and don&apos;t miss the Caesar salad draped with whole mild anchovies. Insider Tip: The restaurant&apos;s closed on Sundays, so don&apos;t try to end your weekend trip here.